At first I loved the camera because it was a challenge. Each shot had to be considered. It took me a little while to understand the interactions between shutter speed, aperture, focus depth, and sensitivity. After a while those things became second nature and faded to the background, but even the day before I sold my camera, I was in love with the lens. I loved that the lens had a ring on it that only rotated about one hundred degrees. A quick two finger rotation and I could whip it into focus on anything. I loved the clicked detentes on the aperture ring, and I always felt pleasure when I snapped it all the way to 1.4, pushing it to its light-gathering limits. I sold the camera for the same amount of money I paid for it. Maybe more, actually. Camera technology had advanced, but this camera was just as outdated when I sold it as when I bought it, so the value hadn't changed. The only reason I sold it was because I wanted to have a camera that could also do video. I wasn't able to find a compact video camera that I was happy with, and combining two cameras into one seemed like a good idea. It was a good idea, but I always missed the feel of my rangefinder. By habit mostly, I still used manual focus on my new camera. But it was a fly by wire focus, so as I rotated the ring, it sent a signal into the camera telling it that I wanted to focus farther away, and then the camera responded by activating a motor to focus in that direction. It was effective, but sloshy. I hate driving stick shift cars, but it made me understand why others love it. But now, a year later, my Panasonic GF1 is up on eBay. Why? Because I think I've found the ultimate camera system, one that combines the new digital photographic technology with one of the best lenses available. 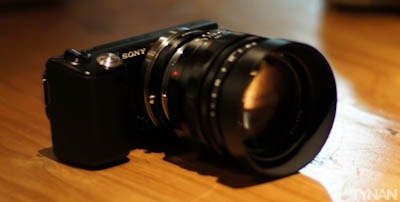 The camera is the Sony NEX-5. I first saw it while I was visiting the Sony Store in Japan. They had a third of one of the floors in their building set up as a mock ice cream parlor. You gave them your name and they would give you lanyard to wear around your neck, which signaled your authority to use one of the new cameras. Then they took a camera from under the camera, wiped it off with a cloth, and presented it to you with a bow. Despite the ceremony of it all, and the amazing photos it took, I wasn't sold. I loved that the Sony had a huge sensor, the same size as most DSLR cameras. A bigger sensor means that more light can be captured at once, enhancing its low-light performance. But, unfortunately, the fastest lens Sony made for it was only a 2.8, which counteracted the benefits of such a large sensor. Then last week, as I got to the camera section of my annual gear post, I felt strange recommending the GF1. It's a great camera, but is it really better than the NEX-5? I decided to see if anyone had managed to shoehorn a real lens onto the NEX-5. Sure enough, they had. In fact, there was an adapter to connect Leica M mount lenses, like the 40mm/1.4 I was so fond of. Immediately I decided that I would at least buy an NEX-5 with a 40mm/1.4. But maybe there was something better? There's a Leica lens called the Noctilux (cool name, right?) that's revered in the rangefinder camera community. Depending on the year, its maximum aperture was .95 or 1, a full stop faster the 1.4. Its low light performance is so good that even at night when our eyes have trouble seeing things, the Noctilux takes pictures that glow. The one problem with the Noctilux is that it's expensive. Six thousand for an imperfect used one, and ten thousand for a mint condition one. That's crazy. But, to my surprise, Nokton had released a new lens since I had a camera that supported their lenses: a 50mm/1.1, just a hair off from the Noctilux, and obviously created to compete with it. I dove head first into reviews, and in the inevitable comparisons against the Noctilux, it fared well. Still, the 1.1 isn't cheap. I managed to wrangle one for $875 shipped from eBay. I justify purchasing it by reminding myself that good glass doesn't often go down in value. I can use it for a year, and if I decide I need the money, I'll just throw it up on eBay. And, really, $1500 total for an amazing camera that can basically see in the dark isn't that farfetched. I just got the camera and lens in a couple days ago, and have gone out shooting once. It's a dream come true. Sony's sensor is much better than the R-D1s, which means that shooting at 1600 produces reasonably grain-free images. That definitely wasn't the case with the R-D1s. The lens feels just like the 40mm/1.4 that I used to love so much. You can see some of the pictures I took on my flickr. I don't think they're the greatest pictures I've ever taken, but you'll get an idea of the low-light performance and the depth of field. That's a long winding way for me to offer this advice: if you want an awesome camera that excels at low light and narrow depth of field, consider a NEX-5 and a 50mm/1.1 or 40mm/1.4. The NEX-3 is even cheaper, and is an only slightly crippled version of the NEX-5. I'll be keeping the 16mm lens that came with the camera, thus transforming it into a less-delicate pocket camera at times, but you could sell that lens to knock another $150 off your total price. All-in, with a little deal hunting and lens selling, you could have an NEX-3 and a 40mm/1.4 for just around $700. I would upload a video sample as well, but I didn't take any decent ones and my internet is really slow right now. Suffice to say that it's probably the best low light video you've seen that wasn't taken with that insane full frame Canon. It may even compete with that... I'd have to do a side by side. Last week I tweeted that I had huge news that I'd reveal this week. I think it's being pushed back to next week. Thank you for this informative post, i bought the nex5 and was looking for some reliable info on different lenses, yeah the one you got is expensive but probably worth it! thank you! Wow that camera looks amazing! Do you ever find it limiting without an sls type viewfinder optical or electronic? awesome. the nex was one on my list to look at next. What adapter do you use? I ordered the wrong one - do u have a model or link I could use? Just picked up my new Nokton 50mm and put it on a GF1. Gorgeous. But I still want more pics from you in San Fran. Hey Tynan, Love the new camera setup. Why the GF1 didn't work well for low-light conditions? You say that it wasn't as good as your rangefinder, but don't make a comparison of it to your Nex-5. I'm trying to decide between a GF2 or a Nex-5 right now. What kind of adapter did you get for your NEX-5 to connect to the Nokton lens? Your posts just keep bringing me back to the site more and more. thanks for the reply Tynan. I've been on the fence regarding this camera, but being able to remap the buttons would make the difference. Look forward to seeing some video from you with the NEX-5. Cheers. Right now the Now the NEX-5 Camera is for sale at $655! I'm seriously considering buying this camera, I would love to take photo's at night that look as good as day-time. I knew I needed a digital camera for Life Nomadic, my 2008 trip around the world. But which one should I get? Point and shoots just don't cut it. The trip was planned to bring me to some of the most amazing places on earth, and there was no way I wasn't going to capture them in the best quality possible. I tried to find high end point and shoots - some costing as much as $500. Still, they just don't have that rich feel that SLRs (the big ones) have.